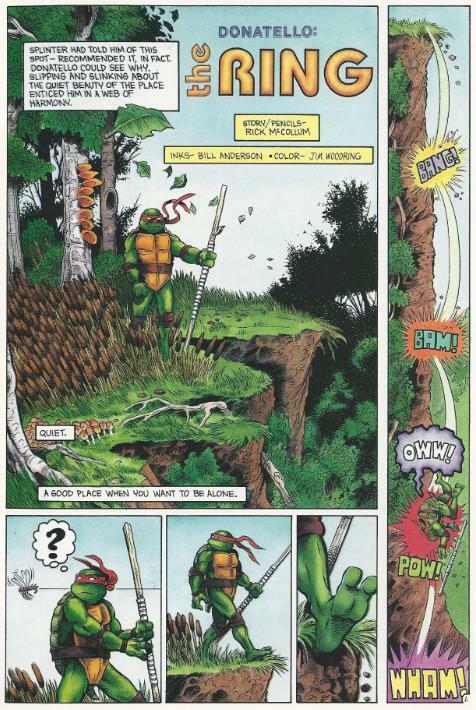 In the woods of Northampton, Donatello finds the lonely spot on the edge of a cliff where Splinter had instructed him to meditate and practice in solitude. Don is impressed by the scenic beauty and, in his distraction, stumbles over the cliff. He survives the fall, but chips off a piece of his shell in the tumble. Looking at it glinting in the sunlight, he sees that much like a felled tree, his shell has rings inside it that denote growth. As Donatello relaxes and contemplates what life might have been like had he remained an ordinary turtle, an unseen presence takes notice of him. The presence recognizes Don as a part of the “ring”; the eternal circle. The presence considers how its people once crawled on their bellies, then rose up but became lost in the process. Soon, they fell and have remained patiently waiting ever since. The presence is glad to have met Don, as it knows that Don and his brothers will help the cycle begin anew. Meditating, Don opens his eyes and catches a brief glimpse of a giant turtle poking its head out of the treetops. Don races back to the farmhouse to tell his brothers and bring them back to the spot where he had his vision. *The story continues in TMNT (Vol. 1) #37. *The contents page lists the title as “The Ring” while the first page reads “Donatello: The Ring”. *The same team is responsible for the short, “Raphael: Snapper”. McCollum and Anderson did not do any short stories for Michelangelo and Leonardo, however. One of the themes that runs throughout all of McCollum's TMNT stories is the dichotomy between the TMNT’s two halves: animal and human. Being normal turtles that were mutated into humanoid anthropomorphs, they exist partly in both metaphysical categories like a multi-ethnic child with dual citizenship. 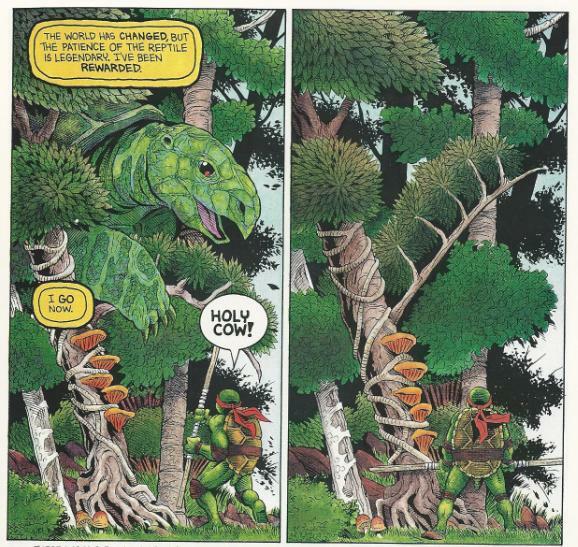 More often, though, TMNT stories tend to focus on their humanity rather than their spiritual kinship to Mother Nature. Personally, I find the former more interesting than the latter, but that doesn’t mean tales where the TMNT explore their bonds with the spiritual elements of Earth’s fauna aren’t interesting every now and again. Michael Zulli’s “SoulsWinter” trilogy did a great job exploring that topic. “The Ring” is a necessary prelude to the full-length “Twilight of the Ring”, especially when you consider that “Twilight of the Ring” opens with Don running into the farmhouse and jabbering about seeing giant turtles in the woods. The second volume of Turtle Soup really was required reading during a stretch of TMNT Vol. 1, as so many Vol. 1 guest issues were spun directly out of the shorts in this anthology. In the end, that’s all “The Ring” really is: a prologue that sets up the main story in TMNT #37. All the same themes will be explored in that tale, but in greater depth, and they’re more worth talking about once I tackle that full issue. On another note, it seems that McCollum and Anderson had designs on doing a full 4-part series of Turtle-themed shorts using the “Turtle Name: ______” titling gimmick. A shame they never made it past Donatello and Raphael, but I guess the cancellation of Turtle Soup put an end to any of their plans to complete the series. What’s interesting is that each short features the designated Turtle having visions delivered by emissaries of the natural world, reminding them of their connection to it. Each Turtle experiences these visions in their own way: Don’s is one of contemplation and study while Raph’s comes in the form of a violent attack. I’d loved to have seen how Mikey and Leo would have received their supernatural visits. 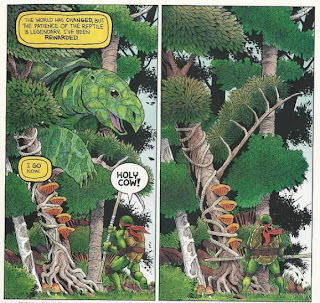 I never really put two-and-two together to realize the pattern McCollum and Anderson were doing with the individual turtles. So thanks for pointing that out, Mark. Kinda makes you wonder if their full intentions were to start out with a short story for each turtle and then follow each of those up with a full comic for each storyline. Could have been really cool if they had been able to continue their stuff.